*Disclaimer: I received a copy of this book in exchange for an honest review. All opinions are my own. What an adorable book! My boys absolutely loved it, but that’s no surprise, as they love anything about dinosaurs. The basic premise of the story is that Candy’s father is very busy with work and she doesn’t get to spend as much time with him as she would like. While she has all the latest and greatest toys that money can buy, she is lonely. Her father feels guilty and decides to get her a special present – a pet Dinosaur – to keep her company. Meanwhile, her friend, Chucky, known for his “one-up-manship” becomes jealous of Candy’s new companion and that’s where things get a little tricky. The story itself is great, but what really captured my boys’ attention is the illustration. There’s artwork on every page and a few sentences to go along with the picture. My 6 year old had no problem reading through the story with me and has wanted to read it every single night since. 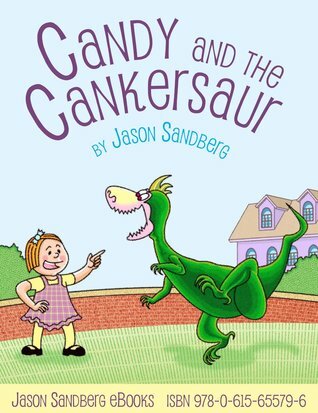 Candy and the Cankersaur is available now on: Amazon, iTunes, Barnes & Noble, and Kobo. If you are a nanny or if you have kids, grandkids, nieces or nephews – definitely pick up a copy of this ebook. I really think the kiddos in your life will enjoy it! AND you’re in luck because author Jason Sandberg has graciously offered 5 copies of the ebook to 5 lucky winners! Enter below for your chance to win.